Thermal imaging is the technique of using the heat given off by an object to produce an image of it or locate it. This technique is used to locate problematic issues such as heat loss, water intrusion or lack of insulation. 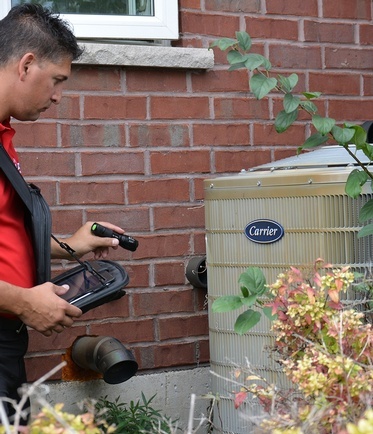 Certified Home Inspectors at Icon Home Inspections, Inc. uses only state of the art thermal imaging equipment in order to provide you with the most accurate and concise inspections. Radon is a naturally occurring radioactive gas that is caused by uranium decay in rocks and soil. Radon is found in all provinces across Ontario and homes with crawl spaces are at a higher risk of radon issues. You cannot see, smell or taste radon. Radon is estimated to cause 3000 lung cancer related deaths annually. Testing is the only way to know your level of exposure. In as little as 48 hours, Certified Home Inspectors at Icon Home Inspections, Inc. can perform an inspection and test for radon in your home. To schedule an inspection or discuss Radon testing, please contact Icon Home Inspections, Inc.